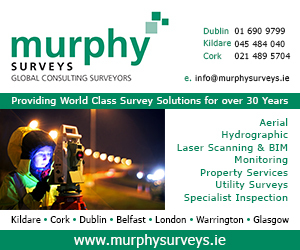 PAUL MOONEY has an update on the Docklands Strategic Development Zone in Dublin. In 2008, the Watchtower and U2 Tower floor plans sat on my desk. Two landmark buildings planned for either side of the Liffey, almost opposite each other, they would be a 30-storey gateway to the new Dublin, suggesting that the city was open for business. With the permission of one of my clients, I went to London to explore the skyscraper apartment buildings of the East End wharfs. I arrived back in Dublin brimming with excitement that our Docklands presented similar opportunities to deliver a new, vibrant beating heart to the growing city. The remaining development land will create approximately 360,000 sq m of commercial space and 240,000 sq m of residential. from the Samuel Becket Bridge to the East Link Bridge. Then the city and Docklands ground to a halt and the shell of what was to be the new Anglo Irish Bank headquarters became the Marie Celeste-like image of the fall of the Irish property and construction industry. The Dublin Docklands Development Authority (DDDA) delivered its final master plan in 2008. It had been responsible for over 520 hectares of land stretching from the Custom House to the outer edge of Poolbeg Peninsula. Since 1987, some 765,000 sq m of commercial space has been granted planning permission, and the population of the area has increased by approximately 10,000 people to 27,000. There has been significant success, enabling Dublin to offer modern office accommodation to international financial and information technology operations in a central city location. 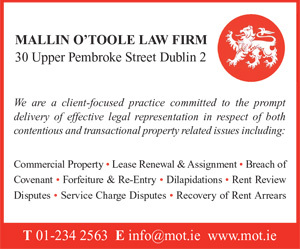 The area has evolved from the early days of the IFSC, where development was commercial occupier led. It now offers a balanced environment suitable for work, living and play. Grand Canal Plaza and Basin are successful, popular public spaces. There is close to a 50:50 mix of residential and commercial buildings, surrounding a magnificent public plaza and basin. In 2014, following an earlier decision to dissolve the DDDA, a Strategic Development Zone (SDZ) was established in the North Lotts and Grand Canal Dock area, where 22 hectares remained undeveloped. This represented significant development potential for major economic and community expansion, within the context of city centre regeneration. The remaining development land will create approximately 360,000 sq m of commercial space and 240,000 sq m of residential. This equates to almost 6,000 new residents and 23,000 workers in an area running from the Samuel Becket Bridge to the East Link Bridge. The area has been divided into 20 “city blocks” of development land, with a further three devoted to amenity areas and parks. Of the 20 blocks, seven have been significantly completed. The SDZ allows for buildings ranging in height from five to eight storeys for commercial, and six to ten for residential, depending on the outlook and street frontage. Five landmark buildings are allowed, of which three are currently under construction, one at Britain Quay and two at Bolands Mills. Two new pedestrian bridges will be located across the Liffey, with a further two at the locks at Grand Canal Basin and across the Dodder to Ringsend. A public transport bridge will cross the Dodder at Britain Quay onto Thorncastle Street, improving connectivity to Ringsend and beyond. 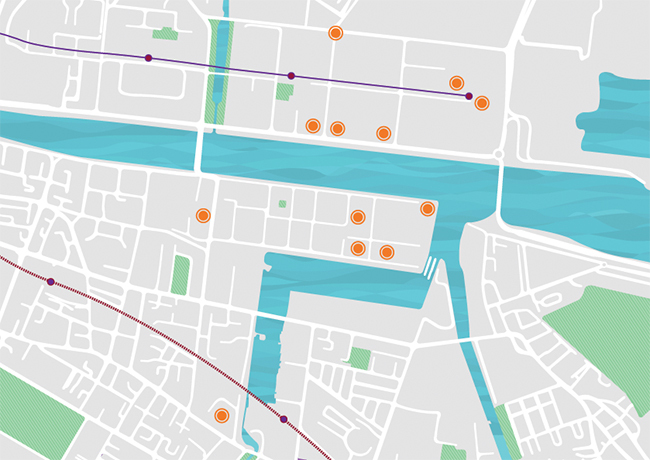 The proposed DART Underground will connect with the Luas Red line at Spencer Dock and significant emphasis is being placed on greenway cycle routes into the Docklands area. Many of the new office and residential developments have significantly lower parking ratios than previous developments, with private vehicles discouraged from frequent journeys into the area. The new waste-to-energy plant under construction at Poolbeg will have the potential to provide power and heat to the entire district. From the outset, future-proofed infrastructure will provide common utility ducts available to private users to improve connectivity and enable robust private communication portals. New civic and public spaces are planned for Bolands Mills, Benson Street, Britain Quay, Mayor Street and the 3Arena, with specific objectives to maximise public pedestrian access to all water body frontages. In the past, the DDDA displayed not only how the Liffey could be utilised as amenity space, but also how the Grand Canal Basin and Custom House Quay’s water features can be animated for public enjoyment. This strategy is to continue. Development is gaining momentum and is benefitting from a reduced number of stakeholders over a more compact development area. They are delivering transport and communications infrastructure, public amenity space and recreational opportunities for residents and workers at the same time. When reviewing the SDZ planning scheme document from 2014, you cannot help feeling a little deflated with the lack of development being realised. Since 2008, the only significant completion has been the stunning Airbnb offices at Hanover Quay. The completion of the Central Bank of Ireland on the old Anglo site is well underway and its new curtain walling skin looks exciting. It is understood that the interior will be cutting edge in design and technology. This is what we should expect from Government agencies: grade-A buildings setting standards in design and work environments. Kennedy Wilson is underway with the landmark development at Britain Quay. Cairn Homes and Bennetts are underway at filling the “missing tooth” of Hanover Quay, between Longboat Quay and the Waterfront apartment buildings, with another waterside apartment block. Ballymore is surrounding the new Central Bank with “Dublin Landing”, a mix of commercial offices and residential apartments which, based on London developments, will deliver quality accommodation for residents and workers alike. What is really impressive is the blocks where planning is granted and pre-planning discussions are underway. At Grand Canal Dock, pre-planning discussions with New Generation for its site at Lime Street/Cardiff Lane are being held in conjunction with NAMA and Waterways Ireland, who plan to develop a site at the east end of the Grand Canal Basin. On the North Lotts, the situation is similar with significant sites having been granted permission at New Wapping Street and the 3Arena, with all other sites in pre-planning discussions. In the entire area, the only site that is not at any stage of planning is the Dublin Bus garage on the Ringsend Road. 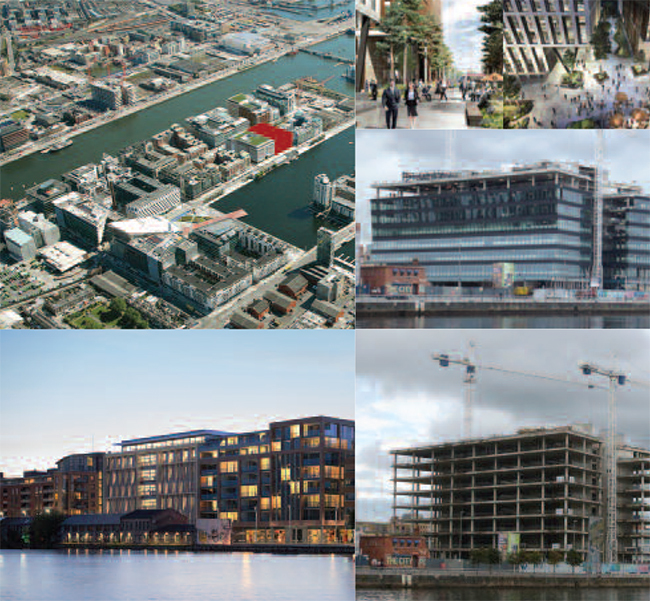 Clockwise from bottom left: forthcoming apartment building at 5 Hanover Quay; aerial view of the Docklands; artists’ impressions (2) of public spaces in the Zone; the new Central Bank of Ireland headquarters; and, the CBOI at an earlier stage of construction. 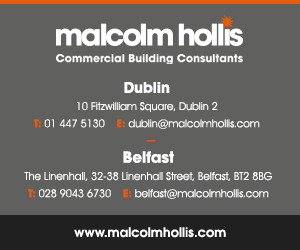 The strategy has improved connectivity between the traditional city centre at O’Connell Bridge and the new central business district, and will evolve with the development and redevelopment of further key sites. The announcement of the SDZ for Poolbeg offers further opportunity to create another modern quarter for the city, and further opportunity for ground-breaking architectural design and a built environment for future generations to enjoy.